Isn't it cute? 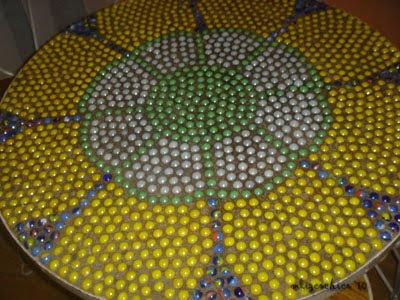 I found this table fully decorated with colorful marbles at Banapple. Oh, I'd like to have one of these, it'll look great on my veranda. Happy Mellow Yellow Monday everyone! Click on the MYM button to view more Yellow photos. Very unique and creative. What a great idea. My MYM is up here. it's cute and very creative!